During a private ceremony in Montreal on Oct. 16, Bill Clinton will become only the second U.S. president to be awarded an Honorary Degree by McGill, joining Franklin Delano Roosevelt, who received his in 1944. Clinton, who will speak at Development and Alumni Relation’s leadership summit that day, was the first Democratic president in six decades to be elected twice – first in 1992 and then in 1996. Under his leadership, the country enjoyed the strongest economy in a generation and the longest economic expansion in U.S. history, including the creation of more than 22 million jobs. After leaving the White House, Clinton established the William J. Clinton Foundation with the mission to strengthen the capacity of people in the United States and throughout the world to meet the challenges of global interdependence. Today the Foundation has more than 1,400 staff and volunteers around the world working to improve lives through several initiatives, including the Clinton HIV/AIDS Initiative, which is helping 2 million people living with HIV/AIDS access lifesaving drugs. 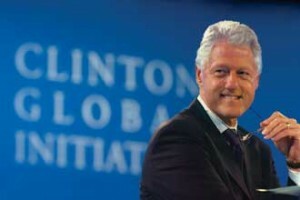 Other initiatives – including the Clinton Climate Initiative, the Clinton Hunter Development Initiative, and the Clinton Giustra Sustainable Growth Initiative – are applying a business-oriented approach worldwide to fight climate change and develop sustainable economic growth in Africa and Latin America. As a project of the Foundation, the Clinton Global Initiative brings together global leaders to devise and implement innovative solutions to some of the world’s most pressing issues. In the U.S., the Foundation is working to combat the alarming rise in childhood obesity, and is helping individuals and families succeed and small businesses grow. McGill will confer the honorary degree on former U.S. President Bill Clinton in a private ceremony as part of its two-day Leadership Summit. The cost of this event is being underwritten by a generous donor who wishes to remain anonymous. Although this event is not open to the public, Clinton’s address will be webcast and all faculty and staff are invited to watch live, as of 10 a.m. More details will appear on the McGill homepage in the coming week.